Year 1983 added a new chapter to the history with the inception of the Vardhman Group. Established with a vision to serve the masses with solutions for the real time problems through the provision of premium grade products, the group facilitates in simplifying the day-to-day living. 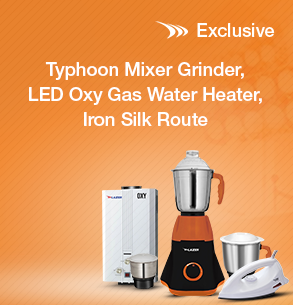 The Vardhman group is a progressive market leader known for manufacturing and marketing fast moving electronic goods, including, fans, irons, pumps, electric water heaters, room heaters, induction cooktops, mixer grinders, choppers, blenders, immersion rods, heating elements, air coolers and numerous more, under its brand name, LAZER. The brand is the largest manufacturer of room heaters, elements, immersion rods and irons in the country. With an extensive distribution network of around 10,000 distributors &retailers PAN India and a service network of around 500 service centres providing doorstep service within 48 hours, the brand has become one of the largest manufacturers and is leading the fastest growing brand in the FMEG Industry. The vast and varied requirements of the clientele are catered through 5 modern manufacturing facilities equipped with automated production lines. These ultra-modern production units manufacture products from the scratch efficiently, ensuring premium quality and flawlessness, enabling Lazer to deliver quality and value to simplify lives. The brand has extended its global footprint by serving completely ‘Made in India’ products to the countries, including, Nepal, Bhutan, Bangladesh, Sri Lanka, Oman and Qatar, with plans to take the venture further to the world. Working in tandem with the ‘Make In India’ initiative of the Government of India, Lazer works on a completely indigenous model. The product range offered by the brand is supported by a backward integrated manufacturing facility, enabling complete production under one roof and generating better employment opportunities. With a workforce of 2000+ seasoned employees and trained professionals, the brand is working efficiently to serve the masses. With one of the widest product portfolio of over 200 products across categories, Lazer currently caters to 24 states through 14 branch offices controlling regional business centres. The Vardhman group is the first to get international quality certification in the entire appliance industry and continuously contributes to the Make in India Initiative by manufacturing high quality products, which are at par with the products manufactured globally. In order to keep pace with global dynamic business practices, Lazer has shaken hands with American Multinationals to rejig the outlook of the brand, in order to add value to the Indian market.